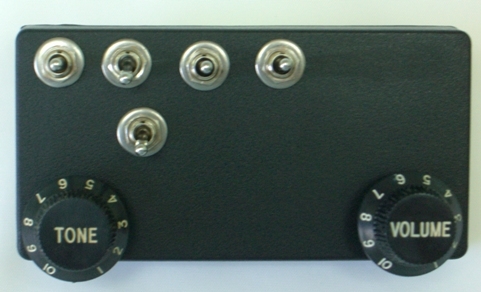 This upgrade is for your 3 pickup electric guitar and bass with thru-body controls. It gives you 29 pickup tones and a unique steam punk look. Your stock guitar is designed to give you a modest and inadequate 3 pickup tones. Don't you think it's worth a few dollars more to get a Grand Canyon Wide range of 35 Blues, Jazz, Metal, Surf, Country  plus the dozens of new and different pickup tones your stock guitar simply cannot produce? SW1 controls the Bridge pickup. Center position is Off, Down is normal phase, Up is reverse phase. S5B controls whether Bridge and Middle pickups are in Parallel connection (down) or Series connection (up). With Switch S5B in the Up position, both pickups must be On (either in normal phase or reverse phase) or you will not hear any output. 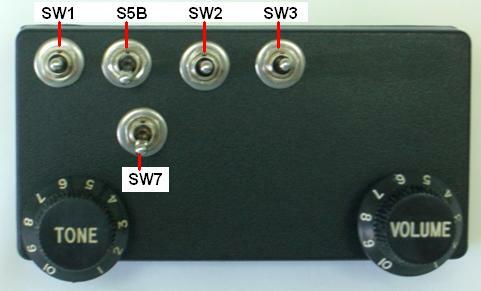 SW7 controls whether the Middle and Neck pickups are in Parallel connection (down) or Series connection (up). With Switch SW7 in the Up position, both pickups must be On (either in normal phase or reverse phase) or you will not hear any output. SW2 controls the Middle pickup. Center position is Off, Down is normal phase, Up is reverse phase. SW3 controls the Neck pickup. Center position is Off, Down is normal phase, Up is reverse phase.